In need of a co-extruder? Euro Machinery sell many used extrusion systems. Right now, we have a super nice Kiefel Blown Film 3-layer Extruder for sale. It is an all-around extrusion line that can process LLDPE, LDPE, LLD, HDPE, BORSTAR, Metalocene, Borcene, and other blends. The 200 mm die head is designed for high through-puts, and has of course Internal Bubble Cooling (IBC). The take off is 1400 mm and has rotating take off. The winder is double, fully automatic, back-to-back. Take a look at the photos and slide-show of this machine here: I want to see the Kiefel Co-Extruder. This Extruder is very well-maintained. If you are interested, please call us directly on +45 63130707 or contact us here. 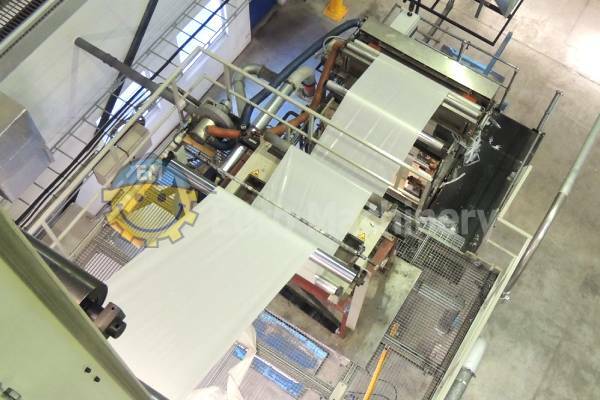 Euro Machinery buy and sell many blown film extrusion systems world-wide to and for the flexible packing industry. There are in our opinion many advantages in buying a used co-extrusion line. First of all, one obvious reason for buying a pre-owned extruder is a smaller investment compared to buying a brand new system. Secondly, a used co-extruder can be turned on for production much faster than a new system. We have several years of experience in guiding our customers to buy the right extruder for them, securely and professional.